Archaeopteryx skull. Archaeopteryx lithographica. Dinosaur fossil replica. Archaeopteryx is the earliest and most primitive bird known. Archaeopteryx lived in the late Jurassic Period around 155-150 million years ago, in what is now southern Germany during a time when Europe was an archipelago of islands in a shallow warm tropical sea, much closer to the equator than it is now. Similar in size and shape to a European Magpie, Archaeopteryx could grow to about 0.5 meters (1.6 ft) in length. Despite its small size, broad wings, and ability to fly, Archaeopteryx has more in common with small theropod dinosaurs than it does with modern birds. 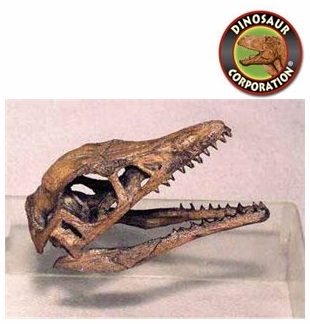 In particular, it shares the following features with the deinonychosaurs (dromaeosaurs and troodontids): jaws with sharp teeth, three fingers with claws, a long bony tail, hyperextensible second toes ("killing claw"), feathers (which also suggest homeothermy), and various skeletal features.